7 Clarence street was in such bad condition it had to be demolished, but under the leadership of the NCC; community stakeholders, heritage specialists and other experts came together for what now stands as a stunning International Pavilion. 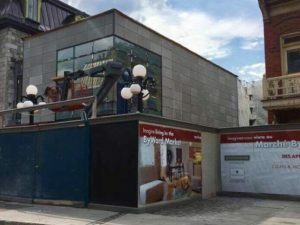 This latest will-be staple of the Byward Market will host multitudes of exhibits, cultural programs and other international enrichment opportunities for the public, which will be hosted by the many foreign embassies in the city. Scrutinous efforts were taken to ensure the new pavilion was constructed with a combination of green materials and the reuse of segments from the old building in such a way that has maintained a sustainable footprint. The International Pavilion will be open to the public by Canada Day, adding to the options for visitors to the city as well as Ottawa residents who want to view this new addition first hand.